SKU: FC-JV. Category: Missile Weapons. Tag: missile. The head of our javelins are made from 4 different foams for maximum safety and durability.The Javelin is a throwing weapon in many games. The javelin is an excellent weapon to accompany almost any fighting style, great for skewering the unsuspecting or unprotected enemy from afar. 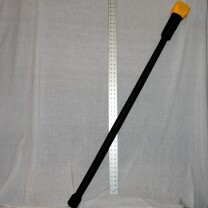 It has a 4′ padded shaft with a soft stabbing head and a regular pommel. All javelins are black with a yellow head. I was very worried from the start that I would not like the javelin but the moment I had it on the field I fell in love. it is very well maid and, I would recommend it to any one. Thanks forged foam and I plan on buying from you guys in the near future. A little less sturdy than I had expected. Also a bit short at 49.5″, which is right on the line of the Dag rules. Throws well and super safe, it won’t hurt anyone. The tip is padded very well as is the pommel, the shaft is a bit flimsy with a lot of flex, but should still pass the 90 degree inspection.